The widgets registered in Accessories are displayed in the order submitted. Enter your height and weight and this widget will display your BMI and give your health a star rating. This much does not require Japanese. The widget also provides some simple health advice based on your BMI. Basic Japanese is required for this. This widget displays the most popular searches for Japanese and Chinese words in the popular Chinese/Japanese online dictionary website BitEx. Updated everyday. The dictionary has over 90,000 Chinese/Japanese entries. BitEx also offers a more social exprerience than just a dictionary. Site is in Japanese and Chinese only. But, for those interested in popular keyword research, this may be a helpful widget. A great widget for Graffiti enthusiasts. Choose from real graffiti images and then add your own comment over them. Choose text's transparency, degree of glowing, and color. Cool way to personalize your webpages. 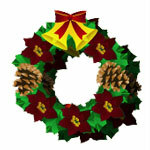 Click on the wreath and go inside. See Santa on his sleigh and open the presents. Add a little Christmas Spirit to your blog. Code is easy to find on widget's web page. Here's a peaceful Christmas countdown widget with faling snow. Aahhhh, I can even hear sleighbells in the sky.. Select from a few similar widgets on the widget's website. 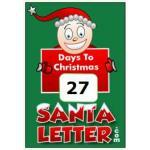 Here's another great Christmas countdown widget. You an also change the time zone display. Getting the code on the web page, which happens to be in Japanese, is actually straightforward. Just click on a time zone, then the Download button, then I Agree button on next screen, and then code should appear. Merry Christmas! 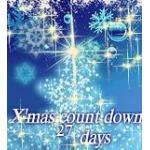 A simple and straightforward, but cheerful Christmas countdown widget. Code is simple to spot on widget's webpage. The title says it all. A seriously simple ticker widget that scrolls a phrase of up to 23 characters across it. Color, phrase and width are all customizeable. On widget's webpage, just click on a color, then add your phrase to Step 2, and then change the width in Step 3 if desired. The code automatically generates below. Here is a perfect example of how nutty Japanese widgets can be. And all just to promote a movie. A little animated white critter (ghost?) pops out from behind the widget and tells you to click on it. Click! He'll then run around and you are supposed to catch him by clicking on him and dragging him over to the top of the widget. Then you'll see some different images of beautiful women and roses. And the picture also changes to a 'handsome' star. All in all, it's just fun playing with the little critter. The code is towards the bottom of the widget's web page. Enjoy! Each day a different scene from the popular Shigezoo mini manga appears on your blog. If you clck the blue button that means [Read] in Japanese, you can read the daily manga. But, just for Japanese readers. The code is simple to spot on the widget's website.